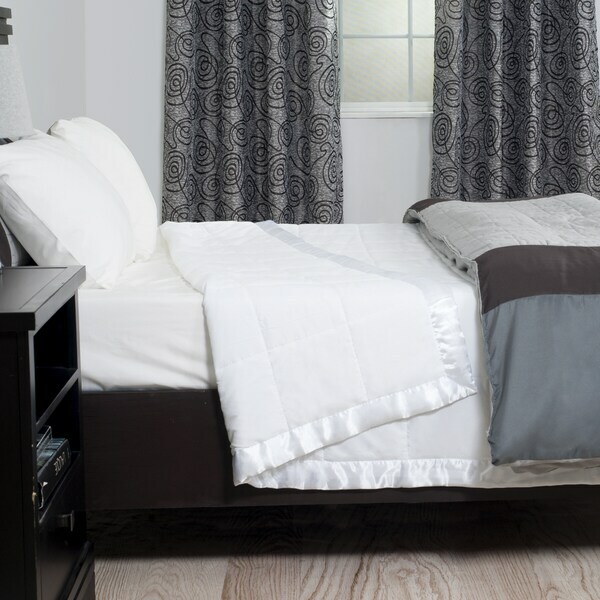 Luxurious, warm, and hypo-allergenic, the down Alternative Blanket from Windsor home will bring you a comfortable nights sleep. Featuring a stitched box construction to maximize fluffiness and ensure the filling stays evenly distributed. I love this blanket! Clean, light and soft! This is my favorite blanket I've ever owned. This blanket has the smoothest fabric, washes well and is warm despite it not being a big thick blanket. It's perfect in our N Florida coastal home. I highly recommend this and it the price is great too! The blanket is on our bed in our winter home in Arizona. It is lightweight and works great as a light cover. During "winter" months, I do add an extra blanket and then we are quite comfortable. What I love is that it is somewhat warm with almost no weight. I'm not a fan of heavy covers. We use one of these in summer air conditioning and two in cold NY winters. They are perfect. Absolutely love these blankets. Warm enough for winter and cool enough for summer. The satin edging makes them a little dressier. I use this blanket between my cotton quilt and sheet to provide added warmth and comfort. It did the job. The blanket is machine washable and does well in the dryer. Just what I was looking for. Easy to wash, warm enough for my purpose. They are used at a coastal cabin, and everyone loves them. Very nice looking! Love the blankets. Could only find them at Overstock. Exactly what I expected, arrival time excellent, condition perfect. Love this blanket will be buying more to set an on the side is so soft. Wash as well. I’ve been using mine for a year now and it looks as good as new.